The Westmont Sister City Program continues to be very busy. 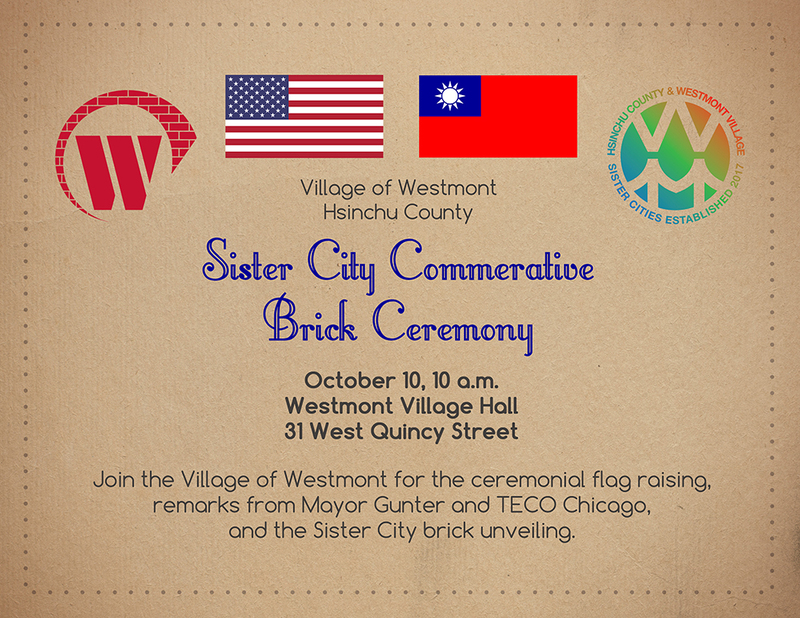 In honor of the National Day Double 10 Celebration, the Village of Westmont will unveil a Sister City brick display in front of Village Hall. The display commemorates our Sister City relationship with Hsinchu County, Taiwan and the success of our exchange this past summer when more than 20 Taiwanese delegates visited our community during the Taste of Westmont. The unveiling of the brick display will be Oct. 10 at 10 a.m. in front of the Westmont Village Hall, 31 W. Quincy Street. Guests will include Director General Eric Huang of TECO-Chicago (Taipei Economic and Cultural Office), as well as other representatives from TECO, local elected officials, village staff, and members of the Sister City Committee. For more information regarding the ceremony and the Sister City Program, contact Larry McIntyre at lmcintyre@westmont.il.gov or 630-417-0280.